In this report we examine the level of digital transformation of SMEs in the Czech Republic in comparison to SMEs from other EU countries. We take into consideration both the digital business environment (digital infrastructure such as Internet availability and digital skills of human capital) and the adoption of digital technologies. The introduction of digital technologies such as websites, social media, e-commerce, electronic information sharing and cloud computing simplifies and accelerates decision making, allows effective brand building, facilitates transactions and makes it possible to reach new customers. 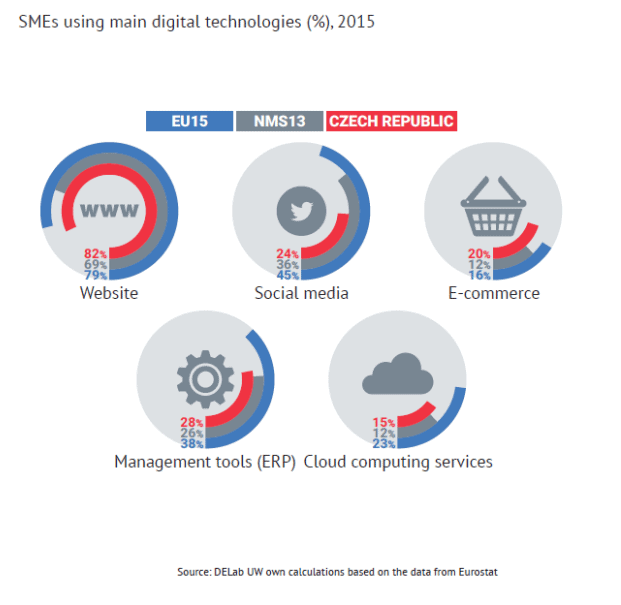 Are Czech SMEs ready to compete on the Digital Single Market? Our analysis suggests that Czech enterprises operate in a relatively supportive digital environment. The digital infrastructure is quite developed, although the Czech Republic lags behind the NMS13 average in subscription to fast broadband. 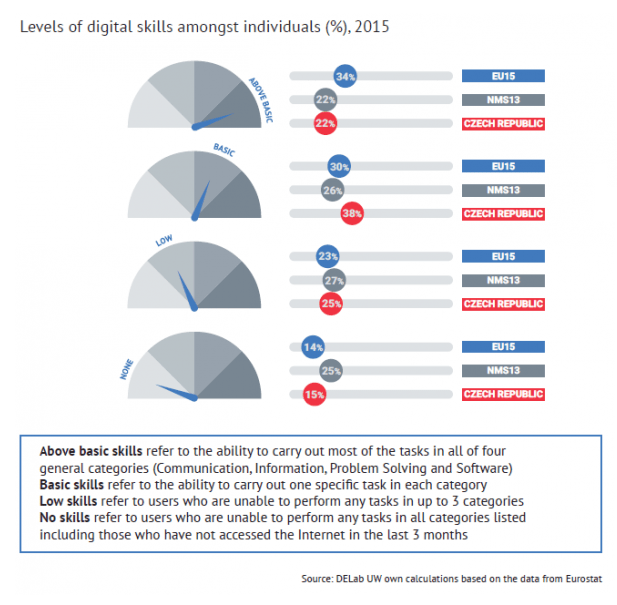 Czechs report sufficient digital skills, although they need to work on their Communication and Software skills and to get more familiar with online services. In several aspects Czech SMEs are among the digital leaders of the region or even of the EU: they strongly engage in e-commerce and lead in using websites for presenting their products and prices. They are more advanced than the other NMS13 countries when it comes to using cloud computing, although they still do not measure up to their EU15 counterparts. Additionally, they do not use the full business potential of social media and other digital tools, such as CRM in the area of communication with their customers. Promisingly, Czech entrepreneurs clearly appreciate the value of digitally skilled workers and invest in their training.